Ennis Glyn’s school had a quiet elegance that extended down to the smallest pupil; Crystal now had a glimmer of what Ruth had meant when she talked of style. For one thing, there was compulsory dress. ‘I never knew dancing schools had uniforms,’ said Ma. Miss Glyn’s girls wore short white tunics and socks, pale-pink satin shoes, their hair tied on top of their heads with a pale pink ribbon; Ma had to knit Crystal a white cross-over, a little short-sleeved woollen jersey that kept shoulders and chest warm. The boys wore black briefs, white vests with a monogrammed EG. The boys wore blue tracksuits, the girls scarlet, ‘to keep them warm,’ Crystal explained – one was among the listed uniform Ma had had to get ready for her which was not quite like the lists of other schools; there was a green skirt and cardigan, white blouses, a green red-lined cloak, but also leotards, white knitted cross-overs, quantities of white socks; later on there would be tights. ‘But you can get all these from the wardrobe at reasonable prices,’ Mrs Challoner, Headmistress at Queen’s Chase, told Ma. commentary: Last month I did an entry on the Noel Streatfeild book Wintle’s Wonders (aka Dancing Shoes). I honestly thought it would be of strictly minority interest – it’s one of my favourite children’s books, and I have come across others who love it, but it seemed quite obscure. In fact this was probably my most viewed blogpost of the year so far, and many people shared it, tweeted and RT’ed, made comments and recommendations. Many of those who loved it were interested in the dress patterns I had used to illustrate the story, and people shared their memories. Then, established blogfriend Lucy Fisher showed me the second picture above - which as it happened was just what I needed. The writer Sarah Rayne had said that the Wintle’s Wonders post reminded her of this Rumer Godden book, so I got hold of it straightaway, and I can see exactly what she means. I sat down and read it almost at a sitting, and at times had to remind myself that it wasn’t a Streatfeild book. It’s a very interesting story – a proto-Billy Elliot: Doone Penny is the youngest of a rambunctious London family. His one sister, Crystal, apple of her mother’s eye, is destined to be a great dancer. But the rather-ignored Doone might have even more talent. The focus is on him, but these are Thursday’s Children, not child, so Crystal gets plenty of time too. Crystal is pushy, pleased-with-herself, spoilt and has low-class tastes. She is contrasted with the wonderful Ruth – calm, plain, perfect with a natural sense of what’s right and correct. Doone sneaks his dancing lessons in various ways – his father (a greengrocer) would not approve at all. He is, truthfully, rather painful, and one has a sneaking sympathy for the awful Crystal who gets a bit cross at his super-talents (music AND dancing) and his ability to smarm up to wonderful famous people. And there’s two more things about the book. One is that I deliberately held off from finding out whether it was aimed at children or adults while reading it, and kept changing my mind. It’s very child-like at some points, but quite grown up at others (again, like National Velvet). So then I checked, and Virago Modern Classics, who have reprinted it, are quite definite in describing it as a Children’s Classic. The other is that it has a very old-fashioned feel – it absolutely does NOT read like a 1984 book, or a book set in 1984. The top picture is an illustration from a children’s annual. 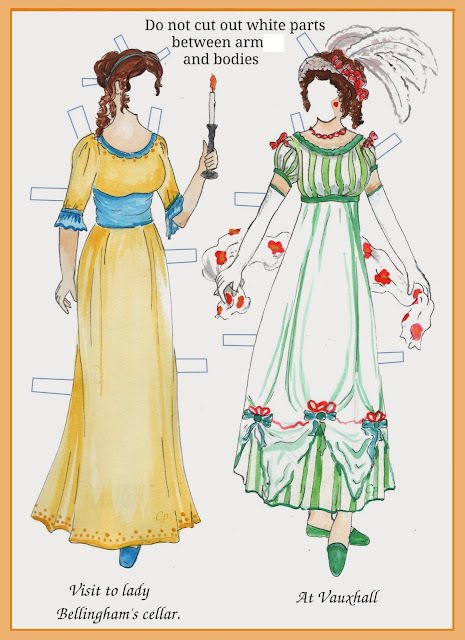 The second is the dress-making pattern - it actually looks like the standard beautiful illustrations for Streatfeild's Ballet Shoes, which I think are by Ruth Gervis. I used to love Rumer Godden's work when I was younger, Moira. You've brought back fond memories :-) . I'm glad you enjoyed this one, and I agree: the dance school context is really interesting. And I always liked the fact that Godden wrote about young people without condescending to them. I didn't take to her as a child, but have enjoyed her more since reaching adulthood. She certainly had a distinctive voice, and a cool clear eye for a children's story. I always get Rumer Godden and Russell Hoban confused in my head - you can sort of see how it happens. Especially as they both wrote children's books about toys. I do enjoy them both, although for me, I find Hoban the more accomplished/thoughtful writer. Godden is good though, and there's REALLY good clothes stuff in the Japanese doll books (Miss Happiness and Miss Flower, and Little Plum). Both are really touching "fish out of water/lost soul found" stories with a LOT about the importance of clothing and accessories both in presenting appearance and in enabling your own life - plus I like "A Doil's House" which has an unexpectedly tragic/bittersweet ending.... I can't think of many books for children that actually have a leading character killed off in such a graphic, unexpected way, and yet make it oddly beautiful at the same time. Blimey - you do a good job selling this, but it does sound unexpectedly dramatic! I didn't get on with Russell Hoban in fact - perphaps I'll come round to him later, as that is what happened with Godden for me. I'm familiar with Rumer Godden's adult books and like them very much, I;m wondering if I'd like this one too. I so wanted to be a ballerina when young, even took ballet lessons. I think any fan of hers would enjoy it, though it is a slightly odd book. But very very readable. Now I was like you - I didn't do the children's books, but Black Narcissus because of the film (Kathleen Byron! The bell!) and House of Brede. Any book with nuns in really... And you wouldn't think of her as a children's author from Black Narcissus - but actually she is good. "Crystal is pushy, pleased-with-herself, spoilt and has low-class tastes. She is contrasted with the wonderful Ruth – calm, plain, perfect with a natural sense of what’s right and correct." Common plonking moral message in 50s children's books – I ALWAYS wanted to be the Crystal character! Ah yes, Lucy, I remember our first bonding over goody-goody Kit in Vipont's Lark books. You wanted her to sing inappropriate modern songs in cafes and run off with the bad lot feckless charmboy. I knew at once we'd be friends. If you want a good cry, try RG's The Story of Holly and Ivy (illustrated by Adrienne Adams). And The Fairy Doll, which I was given as a child. (/I wonder why..../ When I used the word "moral message" above, I really meant "propaganda". I must have really missed out on Godden - I'm getting a great list of recommendations. Moira: When I went to boarding school almost 50 years ago we had no uniforms. The Benedictine monks required ties in my first year but gave up when some guys wore the same tie all year and few made an effort to co-ordinate tie to outfit. I did my best but I was in the minority. You were a stylish chap even then Bill. In England that would have been very rare at that time, to have no uniforms at a boarding school. I read some books by Rumer Godden way back when, but adult books for sure. I wouldn't mind reading more by the author to see if the books still appeal. She wrote loads! I've just read another one by her that I didn't like nearly as much. An unusual writer. I've read some of Godden's adult books, but only The Diddakoi in her juveniles. I loved In This House Of Brede and Five For Sorrow, Ten For Joy. She does seem to jump around in her writing, often switching perspective very suddenly, as you mention, but I find it works for me. It might just be personal preference, though. There wasn't much clothing of interest in Brede or Joy, except in bits, but Cromartie vs. the God Shiva has wonderful clothing. Brede and Joy are the only ones I've loved out of hers, the rest were likes. Cromartie wasn't one of her best books, I believe it was the last one she wrote. But it was still interesting. Adding them to my list! I think I might have read Brede a long time ago (always a sucker for convent books) but have no memory of it.